Made by Florence ceramics of Pasadena California. This is one of their little garden girl vases. 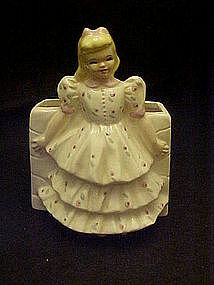 This little lady has blonde hair and wears a calico dress. She stands in front of a garden wall which is the planter area. Measures 6 1/4" tall and she is in perfect condition. No mark visible, but 100% a Florence.